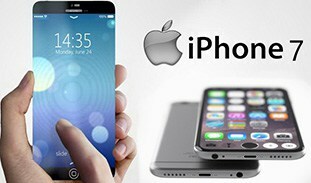 Finally, Apple announced the 4.7-inch iPhone 7 and 5.5-inch iPhone 7 Plus on September 7, 2016. Now, you can clearly know iPhone 7 pros and cons. Obviously, the new iPhone 7/Plus features of dust and water resistance, new Black color and more. In fact, many Apple fans knew these improvements before Apple media event since they are good at speculating the upcoming iPhone's features based on past experience. However, in this article, we still give you detailed information about iPhone 7 including new features, specifications, advantages or disadvantages, price and so on. You have many better choices now when it comes to updating to new iPhone. iPhone 8 VS iPhone 7, iPhone 8 comes with the latest A11 Bionic chip, wireless charging and supports to record 4K video at 60fps. Know more about iPhone 8 tips and tricks if you want to uprade to iPhone 8 or iPhone 8 Plus. The 10th anniversary iPhone X has more pros compared with iPhone 8, starting at $999, the most expensive iPhone and the coolest phone ever. iPhone 7 comes to us with an even better camera than iPhone 6s, and a dual-camera for iPhone 7 Plus. That means you can utilize this 2016 best smartphone to capture more 4K or HD videos and photos to record the memorable moments. Yet, the trouble thing is that your iPhone 7 (though started with 32GB) can only save 2-3 hours 4K videos, let alone dozens of 4K photos, as well. Hence, if you wanna take better use of iOS 10 iPhone 7, you're advised to get more useful tips before. Tip 1: get in-depth knowledge about iPhone 7's iOS 10, which will aid you to better manage iPhone 7 space and Speed up iPhone 7. It now supports you to delete the built-in Apple apps like weather, sports, stocks, calculator, compass and more apps so that you put more control on your iPhone 7 apps management. Tip 2: When you find your iPhone 7 iOS 10 device still has no enough space for usage, you can consider to backup and transfer music, video and photos files from iPhone 7/Plus to computer so as to make more room for other purpose. The highly lauded iPhone 7 manager MacX MediaTrans is worth your attention. It brings revolutionary management for your iPhone 7 video, music and photos. Batch transfer videos and photos of 1080p, 4K UHD to computer with no quality loss. Manage music library with plenty of music editing features (music deleting, playlist creation, batch edit info, etc.) to make your iPhone 7 files in perfect order. Since the iPhone 4s hit the store shelves in 2011, every iPhone has launched sometime during the fall. And this time is no exception. The new iPhone 7 and iPhone 7 Plus were released on September 7, 2016. The startling design abandon the used 3.5mm headphone jack, thus taking a lot of room inside for iPhone 7/Plus. After removing the traditional headphone jack, users rely on the Lightning port for audio or blue tooth headphones, which have the same high definition audio as well. On the other hand, the headphone jack saved space are allowed to improve iPhone 7 battery. The most differences between iPhone 7 Plus and iPhone 7 is that iPhone 7 Plus has a dual-lens 12-megapixel camera which is more advanced including a wide-angle lens and a separate telephoto lens that combine to create 2x optical zoom and 10x digital zoom features. That is to say, you can take more HD or 4K UHD photos with iPhone 7 Plus. Desire to store more 4K photos on your iPhone 7 Plus? Simply, you should learn how to free up space on iPhone. Two new colors are available for the new iPhone: the jet black color and black color. But Jet Black will be limited to 128GB and 256GB models of both iPhone 7 and iPhone 7 Plus. iPhone 7 houses a blazing fast A10 Fusion processor delivering a CPU performance boost of 40% while simultaneously reducing power consumption. Without doubt, A10 processor is more efficient than A9 chip inside the iPhone 6s and 6s Plus. Thus, you needn't to find the proper way to save iPhone 6s battery, you only need upgrade to iPhone 7. Based on the above iPhone 7 feature, waterproof design is easier to realize after abandoning the headphone jack design. After all, it's one less port for water to creep into and wreak havoc with the circuitry. iPhone 7 is completely dust and waterproof with ratings. Once the salient iPhone 7 feature was in place, iPhone 7 will run as usual withstand submersion under water. As the outstanding 4K recording of iPhone 6s and high quality photos, which will continue on iPhone 7, iPhone users need more than ever varied storage options. As it stands now, the largest capacity iPhone checks in at 128GB. And naturally 256GB of storage will put into use to save the 4K Ultra HD videos or high definition photos. Surprisingly, it will be used on iPhone 7 and iPhone 7 Plus. After doing a research about iPhone 7 vs iPhone 6s, you will know that there is no headphone jack on iPhone 7/Plus. 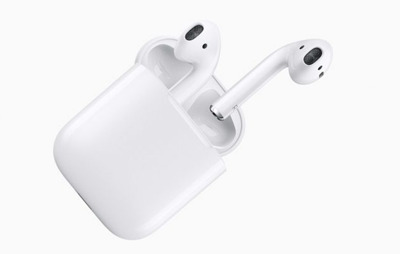 Hopefully, Apple launched an new Siri-enabled wireless earbuds named AirPods for users to enjoy high quality audio. Through the double tap on the buds invokes Siri, users can freely select music, change the volume, check the battery life and more. It is true that iPhone 7 is more powerful with advanced iOS 11 update, no matter on overall performance or specific iPhone 7 features like storage, battery and ability of playing music and videos. iPhone 7 will be able to store more movies/music for offline plyback. Thus you might be in need of a music/movie downloader to batch download movies offline. 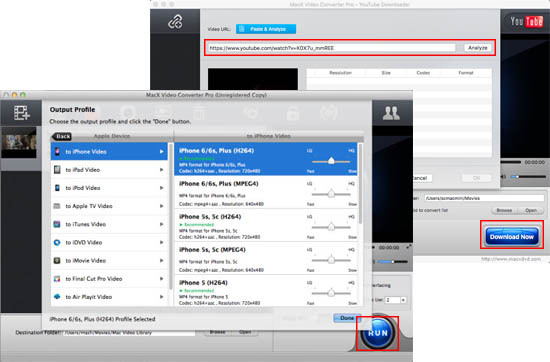 Here, an easy-to-use movie downloader named MacX Video Converter Pro can perfectly achieve your requirments. It provides users the simplest solution to download movies to iPhone 7/7 Plus in MP4, MOV, AVI, MKV, MP3, AAC etc. video/audio from YouTube, Dailymotion, Vimeo, Vevo, SoundCloud, Metacafe, etc. 300+ video movie sites; and convert all downloaded movies/music to more than 350+ profiles for Apple and Android devices, including the latest iPhone 7. Thus you are free to store massive offline movies for offline watching at your spare time.